On March 14-23, 2017, a group of nine Shorecrest Middle School students travelled with Mr. Agier and Mrs. Brill to France. There they met, stayed in the homes of, and went to school with their French pen pals from Lyon and Marseille. 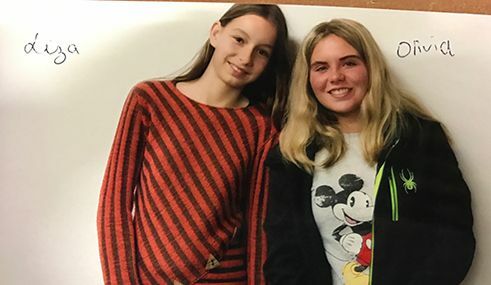 Here are some details about the trip from seventh grader Olivia M.
The trip started in Lyon, where Chargers were met by their pen pals and host families. “It was nerve racking when I first got there because I had just met my pen pal in the airport and left with her. It was nice once I got settled in. The families were so nice and the kids are really sweet. My pen pal lived really close to the school in Lyon. Her family was very modernized, they were into technology and knew everything going on in the United States. They spoke English. They would ask me really interesting questions. When I was just spending time with my pen pal, we often played games - she was into playing board games." On Thursday, March 16, students went to school with their hosts at Collège Ampère. “I liked going to the school, the school was a lot of fun.” They had French food for lunch in the cafeteria such as endive salad with walnuts and coq au vin. Then the Chargers and the French class went together to the Basilica of Notre-Dame de Fourvière. “In the middle of the day we left the school to visit a huge Cathedral. We had to walk up all these stairs and it was so pretty.” The day also included a visit to a Roman amphitheater at the top of the Fourvière hill. On Sunday the SPS group departed from Lyon. They went on to visit Chauvet-Pont-d'Arc, famous caves with some of the best preserved figurative animal paintings in the world, a UNESCO World heritage site. Then they visited The Duchy of Uzès built on an old Roman Castrum, and the highest Roman aqueduct in the world, a UNESCO World heritage site. “There was this really pretty bridge and we walked up to the very top to get a good view. We also had a picnic and I thought that was fun because I got to bond with people I don’t normally talk to." A special tour was next, of a former quarry now used for art-based multimedia shows, Carrières de Lumière​. Images of famous paintings were projected on the walls and ceiling, and it was set to music. For their final day of fun, students experienced a ropes course and zip line together at Parc de Figuerolles. “We went with our pen pals. It was really hard but so much fun. There was a huge zip line at the end. Then they threw us a farewell party at the school."